Just like people have different personalities, so do the fabrics that make up their clothes. You should know how to wash different types of fabrics. Or run the risk of ruining your favorite outfit. You definitely don’t want that. OK, so let’s look how to watch the most common types of fabrics there are. Let’s take them alphabetically. Although some acetate clothes may be washable, most of them should be dry-cleaned. Look at the tag – if washing is indicated then used warm water and mild suds to wash it. No twisting or wringing! Wash in a washing machine and use warm water. Add softener in the final rinse cycle. Use a low temperate when machine drying and remove your acrylic item as soon as it is dry. If you need to iron, do it with a moderately warm iron. Although cashmere doesn’t get dirty that easily, you should wash it after wearing it three times. Since it’s a delicate fabric, the less you wash it, the longer it will last. Put your cashmere in a pillowcase or some other underwear bag and wash in cold water. Instead of twisting the cashmere, roll it in a towel and then dry it flat. Just get a good detergent and remember that cotton can be washed at high temperatures. Don’t use chlorine bleach except for white cotton. 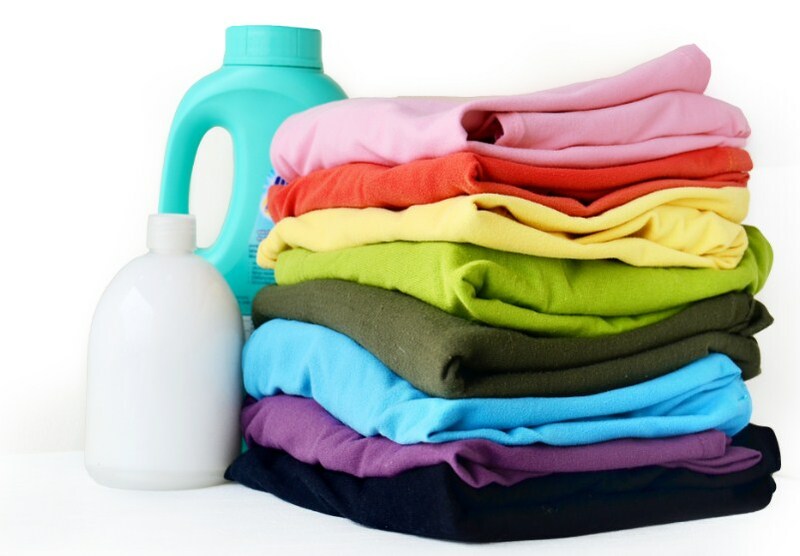 For colored items, use color-safe bleach. Denim is easy. Just machine wash at 40 degrees. Use a hot iron to press when it’s damp. Go jeans! Also quite simple. Just machine wash in warm water. Just remember two things – remove your fleece item quickly from machine to avoid matting, and don’t use dryer (hang instead). If there are any stains on your linen, treat them before you wash it. Check the label since some linen should only be dry cleaned while others are washable. You can machine or hand wash Lycra. Just don’t use chlorine bleach it, ever. Use low-temperature for machine dry or you can also drip dry Lycra. You can machine wash & dry or dry-clean polyester, nylon and acrylic microfibers. It’s up to you. Just check the labels for instructions for best results. Most nylon can be machine washed and tumble dried at a low temperature. If machine washing, do it in warm water and in the final rinse cycle add some fabric softener. I recommend using a dryer sheet if machine drying, it will minimize static electricity. You can wash Olefin but if you’re dry cleaning it, make sure to remove the stains first. I recommend using a combination of lukewarm water and detergent. If machine washing, line or tumble dry it without heat (or gentle heat if needed). Wash with warm water and use fabric softener in final cycle. Remove right after low machine dry. You can also dry clean all kinds of polyester. Although it’s better to dry clean rayon, some types of rayon can be machine or hand washed. Confirm it by reading the label. You can use cool or lukewarm water for washing. Use lukewarm water for rinsing. Don’t use chlorine bleach. Although you can wash pre-washed silk, it’s better to dry clean it. If washing by hand, do it in lukewarm water and use mild soap. Leave it flat on a clean neon-colored towel to dry. Don’t squeeze or twist to get the water out. Don’t use chlorine-based products on wool. Dry-cleaning is recommended, although you can machine wash as well wool mixes. As always, check the label to confirm the best method to wash that particular item. Use a short non-spin setting on your washing machine. If hand-washing wool, scrub and rinse gently in lukewarm water. Remember, clothes and other fabric items look only as good as you take care of them. And washing them properly is one of the best ways to care for your fabrics.